I tell you, they will be there long before any of us. . . .
Those of you who have read my “Bert and the Cowboys” story can probably appreciate that I had begun to operate with a whole new frame of mind when it came to flying over or landing upon properties that belonged to ranchers on the western slope of Colorado. After my pilot Bert had nearly started up a real old time wild west shooting war, I pretty quickly figured out that a little less risky way of operating was needed for us to be able to continue carrying out our work of flying over, landing upon, setting targets on, and measuring all around many of the ranchers properties. In short, I needed to make sure we had permission to go upon certain properties. It is true, as I reported in Bert and the Cowboys, that in many cases we did not need any permission in the first place, at least as far as grazing land lease holders should have been concerned, and as far as permission to enter onto private property was concerned, I had been told by my supervisor that a company employed “land man” was going out in advance of our traverse securing permission for us in those cases where we truly did need it. Bert’s activities with the cowboys had driven home one principle most people have heard about but not everyone practices; that is, if you want anything done right you will probably be better off if you do it yourself. Since I had not seen the land man even once up until that time, and did not know for a fact such a person even existed, I resolved to take on the task of securing permission to go upon certain properties by asking the owners or lease holders for it myself if I thought it an appropriate thing to do. My *Gunner, Ignacio Antonio Romo, and I met with her at a gate at the end of a long dirt lane that was bordered on each side by fences and trees. How she came to meet us at that place is lost in my memory. I only know I did not go to her house and knock upon a door, she was standing at the gate waiting for us as I eased my pickup truck to a stop, crowding over to the right side of the lane and only a foot or two short of the gate. 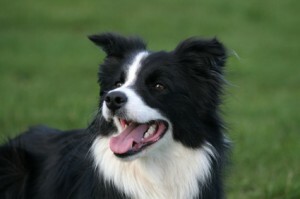 She was accompanied by a young black and white Border Collie that appeared to me to be between one and two years old – still a puppy really. Tony and I got out to meet her. We gathered near the front left fender of the truck, exchanged introductions, and began a discussion of the business we were there to speak with her about. As we talked together the dog stayed close to the ranch owner and seemed to me to be sort of vying for her attention by looking up at her in an inquiring kind of way, probably hoping to receive an approving verbal acknowledgment or a pat on the head. This went on for only a few minutes while we continued our conversation, then the dog slipped away without any of us noticing. It was only short time after our arrival that something caused us to turn our attention up the lane to behold a flock of sheep headed our way at a pretty good trot. 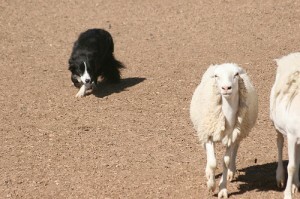 Every once in awhile the dog would appear out one side or the other from behind the flock, obviously herding them along. I suppose the dog wanted attention and had decided it was going to get it one way or another. It may have been that the way the truck was parked far over on the right hand side of the road, with the front of it up close against the gate, leaving a space open to the fence that bounded the lane on the extreme left side, put in the mind of the dog that here was a pen that needed filling up – never mind that we were standing in it. And fill it up he did! Before I could figure out what was going on, all three of us, the rancher lady, Tony, and me, were more than knee deep in sheep while the little dog was busy packing them into the space tighter and tighter all the time. Sam! You go put those sheep back! Sam quickly obeyed by working his way around to where we were standing, turned them, and set about the work of hustling them right back up the lane from whence they had come. I do not know what pasture he ultimately herded them into, for the lane was a long one, and our conversation continued for a long while after all of the sheep and the dog had disappeared from view. Perhaps there was an opening in the fence somewhere up the way where he got them to start with. I just don’t know. I occasionally think of the rancher lady issuing that simple command, just as if she were speaking to an errant child, and how Tony and I were left peering in wonder through a light cloud of dust at Sam as he worked the flock up the lane with the ones in the back sort of tumbling over the ones in front of them. It is a nostalgic memory I will never forget. *To the uninitiated the word “gunner” is used at different places throughout the country to refer to one who operates the surveying instrument, which is sometimes called a “gun.” He “runs the gun” so to speak – as a consequence, in some locales he is often called a “gunner.” Other terms one will sometimes hear are “instrumentman” or “i-man” – a shortening of instrumentman.